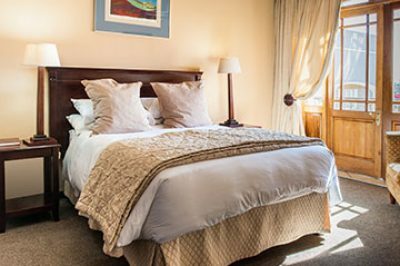 The Royal Terrace Guest Lodge offers classically styled, spacious accommodation to travellers visiting Bethlehem. Situated only 30km from Clarens and Golden gate it is the perfect place to stay whether you are visiting Bethlehem for business or planning to explore the area. The old sandstone building was built in 1919. The new classical touch on the building has a very refreshing look, and blends in beautifully with the old building. As you enter the building you get a feeling of luxury and spaciousness. The tranquility of the courtyard makes you forget your worries for a moment. From the refreshing new classical touch through to the appetising breakfasts, a visit to The Royal Terrace Guest Lodge promises to impress. This is a up-market Guest Lodge with 21 en-suite rooms, DSTV and each with a balcony. There are also 3 self-catering units with fully equipped kitchens and lounges. A romantic bridal suite is also available. A full English breakfast is served in the dining room.